As is so often the case with all of these St Ives services I cant find anything on this one. From 12 September, times will change to reflect the new CrossCountry Trains and First Great Western weekend timetables. There are no changes to the route. The morning and afternoon school day journeys to/from Thurdon Cross now serves Marhamchurch. From 13 September there is a new timetable for these routes. U1 & U2 will no longer go between Falmouth Campus Woodlane and Falmouth The Moor. 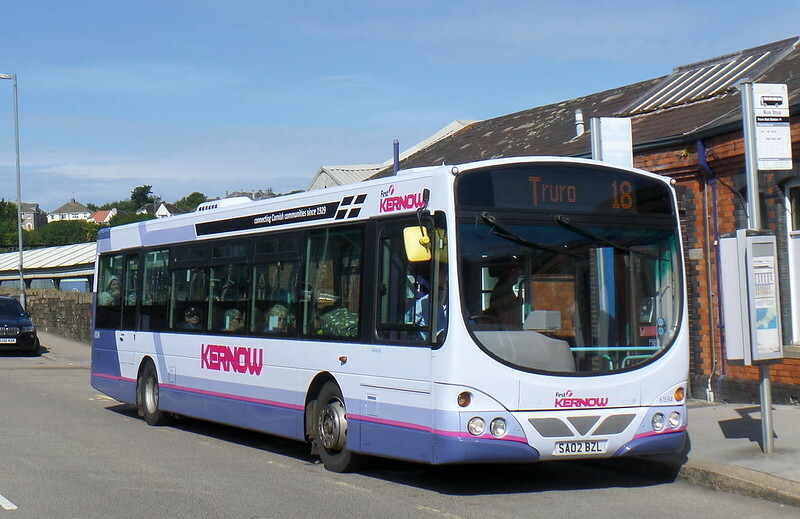 A new half hourly route U3 will connect these locations and Penryn Campus Tremough during Monday to Friday daytimes. The first two northbound and last two southbound U3 journeys will also serve Falmouth Hotel. As with most of these car park shuttles have not been able to find anything about this service at all. Whatever it was, its about to finish. 10 Volvo B7TL/ Alexander are due from Manchester with 30871 30872 30874 30876 30879 all confirmed arrived in Cornwall so far. Another 8 are due from West Yorkshire. When Devon closes down they are expecting 38 DDs , 3 Solos and 3 Darts to join the Kernow fleet. There may also be some DDs from Bristol. There are also the 20 narrow Darts / Caetano buses due. The local fleet list has been updated for First up to the latest PSV Circle new sheets which as seen quite a few disposals confirmed over the last few months including 23204 31457 31458 34068 34171 34188 34189 34219 40038 40580 40598 41156 42207 42459 42634 42834 42844. Additionally Volvo B7RLE's 69229 & 69230 are repainted in Olympia / Urban. Former Western Greyhound Solo K50 WGH is now fleet number 53406 but is still green. I am a bit puzzled, though, at the other comment in the article which is that people in Torpoint are complaining that, with First pulling out, areas of the town will be left unserved. As far as I can see, the Citybus service follows the same route as the 81 and that the only difference in Torpoint will be that they will now have only a half-hourly service into Plymouth. Am I wrong, or is the Cornish Times reporting a non-event?